Changes to accessing information –whether it be your bank or a library database—can be downright annoying, especially when you’ve just acclimatised yourself to the old access route. Post-merger with UCL, we are in a phase of changes. While a great deal of work has occurred behind the scenes pre-merger with UCL (UCL ejournals are now all on IOE Library Search), there is a great deal of meticulous work to be done before all IOE and UCL resources can be fully merged. Presently, there continues to be a lot of activity behind the scenes to enable users more streamlined access to a huge range of resources. During this time, we advise users who want to find education sources to search the IOE catalogue and IOE Library Search. If you want more information outside the subject of education– including UCL print and ebooks– use UCL Explore. A key change you may find when accessing eresources is you may be asked for a UCL login. The majority of IOE eresources can be accessed with your IOE username and password, but gradually this will change so this an ideal time to start using your UCL username and password for accessing eresources. Yes, it can be a pain to have two logins, but it won’t last forever. 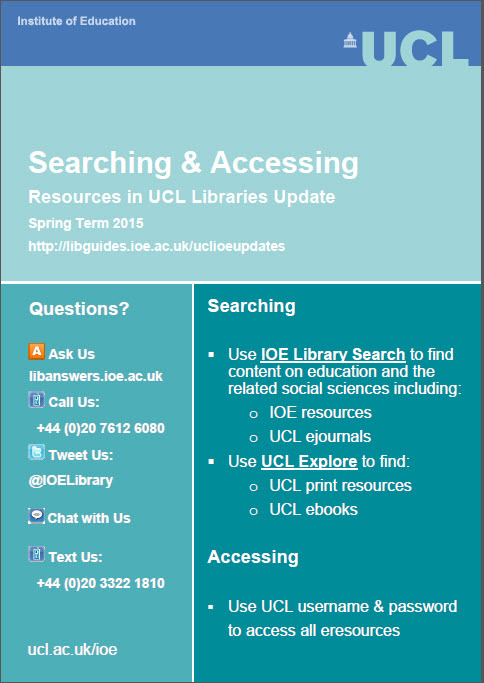 As we receive information about changes, we will pass it on to users on our UCL Library Updates LibGuide at http://libguides.ioe.ac.uk/uclioeupdates. Image | This entry was posted in IOE Library Search, Library, Library and Archives and tagged access, eResources, IOE Library Search, Library Catalogue, UCL Explore, UCL Library Updates LibGuide. Bookmark the permalink.